Pamlico Sound ferry routes return to published schedule. Dredging efforts open Bigfoot Slough to all ferry vessels. 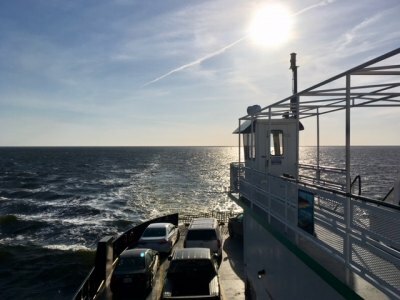 After a month-long dredging effort by the U.S. Army Corps of Engineers, the North Carolina Ferry System is returning to its regular published schedule on the Cedar Island-Ocracoke and Swan Quarter-Ocracoke ferry routes as of 4:30 p.m. today. All vehicle size and weight restrictions have also been lifted. The dredging began in March, after the ferry channel in Bigfoot Slough just outside of Ocracoke's Silver Lake Harbor became too shallow for the M/V Swan Quarter and the M/V Sea Level to pass through it. That required the Ferry Division to reduce its schedules on Pamlico Sound until dredging was complete. "We appreciate the hard work the Army Corps of Engineers did in Bigfoot Slough under rough weather conditions," said Ferry Division Director Harold Thomas. "We're happy to be returning to normal operations on Pamlico Sound, and look forward to a busy summer season."